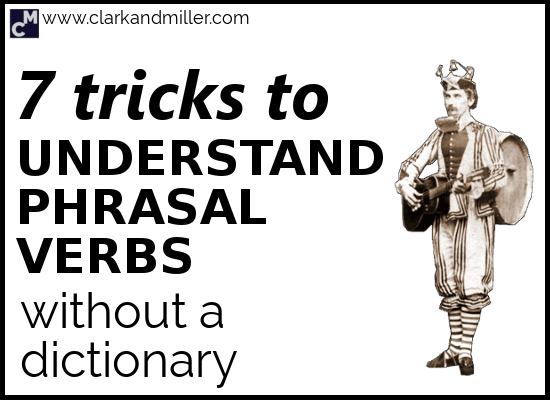 You’re about to learn how to understand the meaning of some phrasal verbs without looking them up! For more phrasal verbs, check out 25 Phrasal Verbs and Their “Normal” Equivalents. Yeah, yeah — I know. Phrasal verbs can be a pain. If only there was an easier way to learn them, right? Well, here’s the bad news first: most of the time, there isn’t an easy way. Phrasal verbs are crazy! But sometimes … sometimes … there’s a system behind the madness. I’m going to show you 7 phrasal verbs tricks so you can use new phrasal verbs in conversation with less effort. You’ll also be able to understand a lot more of what people are saying in English and even understand phrasal verbs without a dictionary. A world will open up to you! I want to start this one with some unpleasant phrases. That’s because, although these kinds of phrases are definitely not very nice, they’re easier to remember. If you don’t like swearing or aggressive language, please look away now. *Be careful! These phrases are definitely not polite! Eugh — not the nicest of expressions. That’s because the word “down” can relax a situation. It’s all about relaxing — about getting quieter, calmer, smaller and more relaxed. Settle down = calm down / get married, maybe have kids, get into the routine of life and stop being so spontaneous. Maybe also get a mortgage. That kind of thing. But we can also use “out” when we want to talk about lots of the same thing going to different people. Like the way your teacher gives everyone in the class the same photocopy. Or how after the factory makes the bikes, and the bikes then go to lots of different shops around the country. Hand out = give something to people in a particular group. This can be students in a classroom, people in the audience at the theatre or the people in your tennis team. Speak out = give your opinion about something honestly and directly. This is usually for something that “needs to be said.” Perhaps it’s something that a lot of people aren’t talking about — stuff that people don’t want to talk about, like how the mafia is running the country or why the president keeps having all those secret meetings all the time. Call someone out on something = tell someone that what they’re doing isn’t acceptable. Like when your uncle’s friend starts with the racist comments again. Or if you have a friend who’s drinking too much. And what’s more complete than saying goodbye to a bad habit forever! And also to that awful hat. Lock up = lock a building securely so everyone can leave for the night and no one is going to break in and steal all the chairs. This is usually used for an office, a factory or another place of work. Finish up = finish whatever it is that you’re doing. But really finish it. Completely. Until it’s finished. Really finished. There are a couple of ways we can use “on”; both of them have a feeling of continuing. Go on and on and on and on = Did you notice the repetition? We use this phrase when someone simply won’t stop talking, or something like a meeting or a terrible film just keeps going and doesn’t finish. Usually, it’s when we find it boring or annoying. Moan on = You know those people who love to complain? They just complain without stopping. Forever. This one’s for them. “Around” is an interesting word. So “around” is not about going in a particular direction, like “off” or “on.” It’s about not really going anywhere at all. That’s why “around” often has a feeling of pointlessness or purposelessness. We use it when there’s not much of a reason for doing something. There’s no target — we’re just doing it. This can be both positive or negative, as you’re about to discover. Hang around = spend time somewhere but without really doing anything in particular. Think about bored teenagers in town. With nowhere to go, they just sort of hang around — looking cool and being unnecessarily noisy, usually. Wait around = wait somewhere for something or someone to arrive, usually without a book or something to do. For those of you who know me well, you’ll know that this is my personal idea of hell. Lounge around = relax in a lazy way. Sometimes this is pretty good. Lounging around on the beach or by the pool is kind of normal. But sometimes it can be used to describe super-lazy people. Wander around = walk somewhere with no particular reason or destination. Just for the fun of walking in a particular place. Think about the high street on a Sunday afternoon. Finally, let’s end with a positive preposition. “Away” is the preposition of freedom. You know that feeling when you don’t care what other people think about you? When you can just do something happily without worrying about doing it right. Just doing something because it comes completely naturally. The other day, for example, I was in the supermarket. There was a guy there who was clearly bored waiting for his girlfriend, who was looking at stuff. So he just started dancing away. In the supermarket. That’s right! Chat away = Don’t you love it when you meet someone and you just “click” with them — you just become friends, and conversation with them is easy and effortless? That’s what this means! OK — so hopefully next time you hear one of these kinds of phrasal verbs, you’ll immediately understand what’s going on. But let’s test out your knowledge! What do these phrasal verbs mean? I tried to talk to her, but she brushed me off. This project’s looking too big. We need to scale it down a bit. They finally broke up. Fair enough — they’d been fighting for months. We can’t quit just because it’s getting difficult. Come on! Soldier on! Hey you! Stop messing around and get back to work! What? You expect me to slave away all day for nothing? I don’t think so, matey! Did you find this useful? Do you know any people (or raccoons) that might also benefit from this? Then BE AWESOME AND SHARE! Spread the knowledge! 7.Slave away: to force a person to work hard or give someone a lot of tasks. 6. Mess around is definitely something without purpose — but I’d say it isn’t doing nothing. It’s more doing something silly or stupid. You know how kids get when they’ve been left alone for more than 10 minutes? They end up messing around. 7. I think you’ve got this — but remember that the person doing the hard work is slaving away — not the person forcing it. Very useful info. It is just a bit harder for esl students to consolidate the real meaning unless they use it very often naturally in common usage. Yes — as with pretty much any new language, practice is always the key to real consolidation and learning. Since I teach writing, I love this post. Using phrasal verbs correctly will make your writing sound so much more natural. 1.I tried to talk to her, but she showed no interest and refused to listen to me..
2.This project’s looking too big. We need to lessen the expences and reconsider it a bit. 4.They finally split up. Fair enough — they’d been fighting for months. 5.We can’t quit just because it’s getting difficult. Come on! Don’t stop! Do your best! 6.Hey you! Stop wasting your time on doing nothing and get back to work! 7.What? You expect me to work as hard as I can all day for nothing? I don’t think so, matey! Thanks for answering these — good work! If you can, can you include a few more phrasal verbs in the answers? Like you did in answers 2 and 3 (“big night out” and “split up”). Very, very useful approach to phrasal verbs. Thank you so much indeed, Gabriel. Thanks Gaby. I’m glad you liked it. I hope your weekend was FANTASTIC! Good job, Gabriel! You’ve been very, very helpful. As always) Thanks a lot! Thanks Marina. I’m glad you enjoyed it! Also — I love your email address! Absolutely amazing, very practical as well, thank you. I’ve been studying english for almost two decades and this is the most practical and easy definition to let phrasal verbs. Gabriel, could you help me out to decode in the mode the phrasal verbs that end up in: -back, -over, -in, -about, -along, -through. Thanks for your awesomely positive comment — yes, phrasal verbs are awesome, but can be a pain to learn. Your suggestion is definitely interesting and I think there might be a post in it — at least with “back,” “over,” “along” and “through.” Off the top of my head I can think of some examples that appear to fit into a pattern. I’ll do some research on that and if there’s anything in it, then there will be a post to put out! Man, you are certainly a magician. Thanks a lot. Please keep up the good work! Thanks Gabriel you made it so easy to learn..
My pleasure! Keep up the good work!